Would you like a work truck that offers best-in-class towing and payload capacities? And what if that truck came with reliability and high fuel efficiency to sweeten the pot? That's exactly what this F-150 offers. The F-150s have reputation for never disappointing their owners and this truck will do the same for you. For your peace of mind this truck comes with Ford Certified Pre-Owned Warranty. 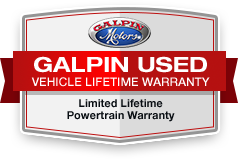 So call us today to make this truck your next ride and experience 'Galpin Used Car Difference'. All figures are EPA estimates. Actual mileage will vary. Kelly Blue Book values are calculated based on the current Retail Book. Pricing analysis performed on 3/26/2019. Fuel economy calculations based on original manufacturer data for trim engine configuration. Please confirm the accuracy of the included equipment by calling us prior to purchase.